Questions about attending an event? How long is the FreshAirCinema season? What time does FreshAircinema start? I'm under 18; can I still attend FreshAirCinema? Can I bring children to FreshAirCinema? Will there be food and drinks at the venue? Will I be able to see and hear properly? Are pets allowed at FreshAirCinema? Can I take photos or capture any video? Can I hold my birthday/company/family celebration with FreshAirCinema? FreshAirCinema hosts events year round. However, the majority of our events take place between June and September. Please visit our “Events Section” to get an updated list of upcoming events in your area. FreshAirCinema can host their outdoor movie events just about anywhere. We can set up almost anywhere…the street, the beach, the local park, on top of a parkade or even out on a barge. As every event we host is unique in itself we suggest you stay tuned to our events section to see where the next outdoor movie event closest to you is being held. Our Outdoor Movie Events start at dusk (about 20 minutes after sunset). There is usually no allocated seating times at events hosted by FreshAirCinema. Some events will have the doors open between 6-7pm. However, each show is unique so please see our events section for more details on each specific event. It is best to be there as early as possible to ensure yourself a good spot in front of the big screen. There usually is plenty of excitement and activities to keep you entertained prior to the beginning of the movie; music, magicians, inflatable bounces houses just to name a few. Or simply grab a ball and glove or Frisbee and simply enjoy the outdoors prior to the show. Absolutely. 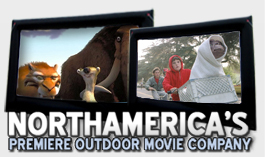 All free to the public outdoor movies screened with FreshAirCinema are rated G or PG. For PG related films you should have your parents consent before attending the show. Can I bring a chair/blanket? Yes, we encourage it. Alternatively you can bring low beach chairs, cushions, blankets, rugs, bean bag chairs, inflatable couches/mattresses etc. Food and drinks will be made available at almost every event. In the event of rain, the event will likely be cancelled and rescheduled for another date. Please stay tuned to our events section for more information. Please contact FreshAirCinema if you have any lost items. In the event there are insects present, we would advise that you come prepared. We always carry spray in case someone forgets so please ask one of our technicians if you forget. Yes, you will. The sound and projection technology used by FreshAirCinema is designed specifically for the outdoors. Depends on the event. Please see our events section for information on the event that you would like to attend. Photos with your friends are permissible. However, anyone found taking photos or motion captures of the screen will be treated in accordance with Canadian Law governing copyright and piracy and will be handed over to the authorities. Members of the press, kindly inform us of your intentions with regards to video and photography as we will furnish you with the appropriate accreditation to allow you to take photographs and video as required. Yes, you can. Please call one of our sales reps for more information. "If you would like to learn about events happening in your area then please join FreshAirCinema's Facebook group"